The decision to argue about military interventions is kind of like the decision to actually launch one. It usually is undertaken reluctantly in the first place, leads well-intentioned participants into a quagmire, and produces unsatisfying results. Nonetheless, here I am. I will keep this quick and clean—no boots on the ground. First, a confession: when faced with either the immediate threat or the forensic stench of massacres like the one perpetrated in Syria last week, my initial reaction is usually to favor doing something. To me it’s like hearing that a house is on fire with kids inside. It’s an emergency. People are saying that firefighters might get hurt, or even killed; sending them in may not be cost-effective; and, oh yeah, the fire’s in a different jurisdiction. But once we are confronted with such stark evidence of coldly planned mass murder, and the grim knowledge that the killing isn’t over, many of us conclude that something simply has to be done. Inaction, however wise, is simply inhuman—for God’s sake, let’s move. But I try to temper that impulse. I sift through the uninformed grumbling that saturates my corner of the Internet in search of nuggets of well-reasoned caution. They exist, as it turns out, and they are compelling. This is a difficult issue. Having reached no firm conclusion at the moment, I’ll just highlight what I deem the best and worst arguments of both sides. The Best Argument For Intervention is simple: Up to 1,300 people were murdered using barbaric weaponry. There is a moral imperative to prevent more of this killing and punish those responsible (almost certainly the Assad regime). It may also be worthwhile to enforce international norms against the use of chemical weapons (“norms” instead of laws, since Syria is one of seven countries non-signatory to the Chemical Weapons Convention). The Best Argument Against Intervention is that it will end up causing more deaths than it will save. This is different than saying that intervention won’t save lives; in a war so deadly, virtually any major intervention will both save people who would have died and kill people who would have lived. The assertion that intervening will cause more deaths than it will save is sobering, but very difficult to test; we will only observe one outcome. If we can credibly predict a net loss of life, though, we should pause and consider alternatives. The Worst Argument For Intervention is anything amounting to a claim that it will end the fighting or stabilize the country. The fighting will continue and the country will remain unstable no matter what we do. Intervention should be undertaken, if at all, with modest and clear objectives. The Worst Argument Against Intervention is the argument that because Western countries have perpetrated, supported, and condoned mass murder and war crimes in the past, they should not intervene. The premise—that the West is complicit in past atrocities—is undoubtedly true, but the argument is illogical. 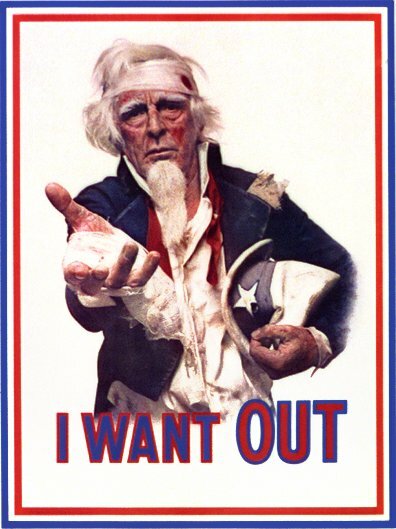 Past behavior does not bear on the question of what America or other countries should do now. To claim that it does is like saying that America shouldn’t reduce carbon emissions because it is a major polluter, or that it shouldn’t protect minorities’ voting rights because it used to deny them. It’s totally nonsensical. It appears that, for better or worse, some sort of foreign military intervention is coming to Syria. If so, then some people are going to die and other people are going to be saved from death. Most commentators I’ve heard weigh in on this question sound very sure of themselves, but I’m not, and I don’t think we should be; in fact, I advocate moral and ethical discomfort in this case. During the coming weeks, we should seek out the information, often willfully ignored, that contradicts our expectations. Those who bother to criticize President Obama’s foreign policy (and let’s be honest, most Americans just don’t care) often focus on the results we’ve failed to achieve. In the Middle East, as elsewhere, it’s true that many desirable results have gone unachieved: the Israeli-Palestinian “peace process” is so moribund that many question whether a two-state solution is even a realistic goal anymore, Syria continues to disintegrate, Iran’s centrifuges spin on, a new spasm of violent unrest grips Egypt, and sectarian violence continues to thrive in Pakistan and Afghanistan. What’s new? The Middle East has problems. But the president’s foreign policy rests on the premise that we can’t solve all of those problems. Because he didn’t say he was going to stop the killing in Syria, its continuation isn’t a policy failure. It’s a tragedy, but not a failure. You can’t “fail” to get results you never tried to achieve. The bold international actions of President Obama’s first term were the intervention in Libya and the killing of Osama bin Laden. The former served its immediate goal of preventing a massacre in Benghazi by Colonel Qaddafi’s forces—though some unfairly point to Libya’s current disarray as evidence of the intervention’s failure, as if letting Qaddafi fight and kill longer would have somehow prevented the current violence. The latter was straightforward, if risky—bringing bin Laden to justice (or, as it happened, bringing justice to him) was a foreign policy goal no president would have been likely to modify or scrap. Both of these actions, different as they were, were relatively quick and small-scale. In both cases, we got results. But otherwise, the administration is largely letting things play out. The president does not aspire to build or liberate nations. He’s stepping back and slowing down. He withdrew U.S. troops from Iraq, where our influence has since withered considerably, and his advisors now debating just how small a force to leave in Afghanistan, where we never had much influence at all. This is not to say that the President has shown no initiative. It’s just that the goals and the posture are modest. President Obama reached out to Iran in an effort to strike a deal on its nuclear program but, once spurned, became rather incoherent and indecisive. He’s given some financial support to aid efforts in and around Syria, and deployed Patriot missile batteries to Turkey (defensively and in keeping with our NATO obligations) but only mobilized meager diplomatic military resources to try to stop the conflict. He’s made uncomfortable noises about Israeli settlements, but never got in Netanyahu’s face. The arc of history, as Obama is fond of saying, is long. His America speaks softly, and no one expects it to use that big stick. Some believe that this scaling back of our ambitions is exactly the adjustment America needs, especially after a decade of war that it’s very easy to argue wasn’t worth it. The president is cautious and inward-looking, and so is the public. Even the administration’s political opponents have difficulty finding criticisms of his foreign policy that will resonate with anyone (that difficulty may help explain Republicans’ collective leap to exploit the administration’s handling of the Benghazi attack in the final weeks before last November’s election). Whatever one thinks of the “Obama Doctrine,” it is decidedly non-grandiose: expect neither fiascoes nor breakthroughs. And ignore the people who say “we’ve failed” when people kill each other and countries fall apart far away. Failure is the wrong word. We didn’t fail. For better or worse, we’ve decided not to try. Here’s the situation. Northern Mali, also known as Azawad, is populated mainly by the Tuareg, a Berber people who inhabit the arid interior of West Africa between the mostly Arab north and the mostly black coastal areas. Many Tuareg served in the Libyan army, which disintegrated in 2011 during the Libyan uprising against Muammar al-Qaddafi, sending both Tuareg and weapons flooding into neighboring countries. In Mali, this influx catalyzed an insurgency movement aiming to liberate Azawad from Malian control (although Tuaregs rebelled in Mali several times before the fall of Qaddafi). The insurgents organized under the banner of the National Movement for the Liberation of Azawad (MNLA). In March, the Malian army lost faith in the president’s ability to fight the insurgents, and removed him from office. 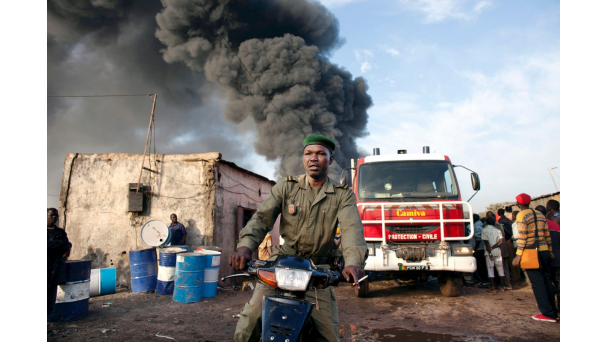 Two weeks later, the MNLA took advantage of the instability in Bamako and declared Azawad independent. At that point, it controlled virtually all of Azawad, which makes up more than half the country—an area roughly the size of Texas. Sounds like it’s just an ethnic war. Why all this talk about jihadists? So where does al-Qaeda come in? Well, there have been militant Islamist groups in North Africa for decades, and during this last Tuareg uprising, a group from Azawad called Ansar al-Dine had aligned itself with the MNLA against the government. But once the fighting died down, Ansar al-Dine began implementing a harsh form of sharia and calling for the complete overthrow of the Malian government. In April, the group announced that sharia was to be implemented in Timbuktu. It also rejected the MNLA’s call for independence. Some amputations and executions were reported. Since the spring, the rift between the Islamists and the Tuareg nationalists has widened such that the MNLA supported Operation Serval, the French intervention launched last week to counter the Islamist fighters. Today, the French army fought militants in the recently conquered town of Diabaly. The battlefront extends across Mali’s narrow midsection, separating the government-controlled South from the rebel-occupied North. Meanwhile dozens of foreign nationals, including Americans, were taken hostage at a gas field in Algeria, just across the border from Libya. Algerian forces have surrounded the field, but the standoff has yet to be resolved. The attack has raised eyebrows in the energy industry, which generally considers Algeria a safe place to do business. It appears that the seizure is a response to Operation Serval. Al-Qaeda in the Islamic Maghreb, a group that seeks to overthrow the Algerian government and attack Western targets, has taken credit. The French public supports the intervention almost two to one. A variety of causes may be behind this support, including a sense of responsibility for a former colony, economic interests (Mali is a major gold producer and borders Niger, a vital uranium exporter), and security concerns. France originally planned to provide aerial support and logistics to an African-led intervention. Alassane Ouattara, the President of the Ivory Coast, was planning to take the lead in Mali in his capacity as chairman of the Economic Community of West African States (ECOWAS). The plan was for African ground troops to restore security in Mali, with support from France, but without French boots on the ground. However, when French bombardment proved unable to stop Ansar al-Dine from beginning an offensive aimed at taking the whole country, President Francois Hollande sent in troops. It’s not just France that cares about Mali. Control of such forbidding territory gives jihadist groups breathing room and access to weapons (especially after the implosion of Libya) and cash (from ransoms and exploitation of South American drug-smuggling networks that have begun taking advantage of weak states in West Africa). I should note that in mid-nineties Afghanistan, another little-known fundamentalist force called the Taliban began to thrive under similar conditions: lawlessness, a glut of weapons, and a source of income (charging Pakistani truckers for safe passage on Afghan roads). UPDATE: The BBC reports that many hostages have escaped. The captors’ demands include a full French withdrawal from Mali. This Thanksgiving, I’m grateful that two groups that don’t understand each other have stopped lobbing shoddily constructed, inaccurate explosives at each other. I’m not just talking about Hamas and the IDF; I’m also talking about their uninformed partisans on the internet. Vapid tweets about Israel’s right to defend itself or Palestine’s right to resist occupation are worse than unhelpful. They contribute to a cyberwar of attrition, and exacerbate mutual incomprehension by further convincing people that their opponents are clueless and will never understand them. I’m not going to try, in this post, to assign blame or make grand pronouncements about “the only way” to solve the Israel-Palestinian conflict (which almost always turns out to be something totally unfeasible and one-sided). Instead, I’m trying only to intercept some of the shoddiest and least accurate weapons launched by the two sides. I realize I’m dividing the political cyber-spectrum rather crudely, but that’s because I’m addressing those who are crude. Subtle thinkers need not read on. Stop abusing the idea of proportionality. It seems that many of us think that the only fair way for Israel to respond to flurries of Katyusha and Grad rockets from Gaza is to assemble equally crappy rockets themselves and fire them aimlessly back. This reflects a fundamental misunderstanding of the concept of proportionality. Proportionality, according to the International Committee of the Red Cross, is achieved when “loss of civilian life” and/or “damage to civilian objects” is proportional to the “concrete and direct military advantage anticipated.” It’s about the damage you inflict relative to your aims. It has nothing to do with the difference in losses between the two sides. This means that, legally speaking, Israel’s campaign could be disproportionate without killing anyone, or that it could be proportionate even while killing 2,000 people, depending on the military gains involved. It could also mean that Hamas’ rocket attacks are themselves “disproportionate.” Israel’s campaign may indeed have been disproportionate, but that can’t be proven simply through lopsided death tolls. Stop scoffing when Israeli security concerns are raised. First of all, minimizing Israeli casualties shows a failure to understand how states work. No Israeli politician can say, “The 500 rockets only killed five people. Everyone calm down.” Nor should they. A state’s most basic duty is to provide security to its people. A serious solution to the conflict cannot dismiss the threat of rocket attacks. But it’s not just the rockets; rhetoric matters too. Hamas has powerful allies and the capacity to inflict damage and, more importantly, terror on Israel. Right now, most Israelis believe that Hamas will kill as many Israeli civilians as its capabilities allow. 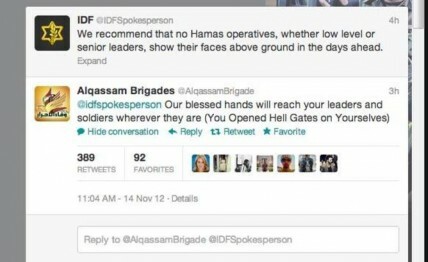 Given the kinds of things Hamas leaders say about Israel, this is understandable. Ridicule these concerns if you like, but they will affect Israel’s future behavior and, by extension, the fate of Palestine. The more seriously Israel’s concerns are taken, the sooner the conflict will end. Stop describing “them” as utterly implacable. It’s tempting to paint Hamas, or the Arab public in general, as unanimously rejectionist or even genocidal toward Israel. It’s also easy, because there are plenty of wackos out there who will furnish unambiguous quotations that seem to confirm this. It’s true, for example, that the Hamas charter calls for the destruction of Israel (“Israel, by virtue of its being Jewish and of having a Jewish population, defies Islam and the Muslims”). But don’t let Hamas stifle your imagination. If the past two years have taught us anything about the Middle East, it’s that ideologies are dynamic and people are complex. Norms can break or bend (until 2011 Libya, did you ever expect to see Arab protests calling for Western military intervention?). Israel should be creative, engage with Palestinians much more aggressively, and think of Gazans as potential partners instead of writing them off as lost to Hamas (unfortunately, it seems like Ahmed al-Jabari, whose assassination helped catalyze this latest bout, might have been one such partner). As for negotiating with Hamas: many bristle at the notion of talking to violent religious fundamentalists but, as the U.S. is learning in Afghanistan, sometimes there is no other choice. Stop touting Israel’s irrelevant virtues. Israel is the Middle East’s only true democracy. Israel invented the cell phone. Israel respects the rights of gays, minorities, and women. No matter how impressive the distinction, a war between Israel and Gaza isn’t the time to highlight it. Doing so sounds evasive and suggests that more successful polities have earned the right to dominate less successful ones. Do us all a favor and at least address arguments or facts inconvenient to your point of view. The pro-Palestinian and pro-Israeli internet spaces have constructed two utterly divorced realities. Those whose timeline of the most recent round of violence begins on November 14, with Israel’s killing of Hamas military chief Ahmed al-Jaabari, should look back to November 12, to when Hamas launched over 100 rockets at Israel in a single day. On the other hand, those who use that escalation as the starting point should consider the effects of Israel’s military and economic blockade of Gaza. And so on. Warning: This may involve learning some history. The Westboro Baptist Church (godhatesfags.com) pickets the funerals of soldiers killed in Iraq and Afghanistan because they fought for a country that tolerates homosexuality. Church members spend their time shouting slogans and waving signs reading God is Your Enemy, Pray for More Dead Soldiers, and Thank God for IEDs. Unlike the YouTube community, the grieving families cannot ignore these outrageous insults shouted directly at them at their loved ones’ funerals. The burial of their sons and daughters is tarnished forever. In 2011, the U.S. Supreme Court ruled 8-1 in favor of the Westboro Baptist Church’s right to hold these protests at funerals. 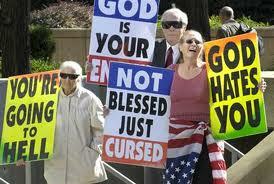 I consider myself a First Amendment purist, but the case of Westboro Baptist Church gave me pause. The case of The Innocence of Muslims does not. In the aftermath of the embassy attacks in Benghazi, many promising things have happened. 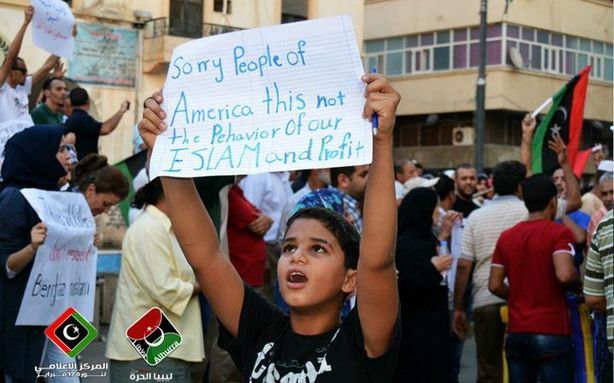 Libyan protesters drove the militia thought to be responsible for the killing from Benghazi. Muslim political and religious leaders condemned violence as a response to speech, even blasphemous speech. A public conversation seems to be unfolding within the Islamic world about ways to respond to blasphemy, and it’s the first one I’ve ever seen. At the same time, some Americans have begun calling for a narrower reading of the first amendment. Keep in mind that this conversation is only happening because of violence. Argument 1: We’re an outlier globally. Political Scientist Erik Bleich made this argument in an al-Jazeera column last week. Most Western countries, he says, have recognized the need for common-sense restrictions on free speech as a way of maintaining order. He points out that even Danish government, in the wake of the Jyllends-Posten cartoon scandal, suspended the broadcasting license of a radio announcer who called for exterminating some Muslims. Incitement is different from mockery and insult. The Innocence of Muslims was not incitement. The Danish government did not punish Jyllends-Posten, so his example is irrelevant. Next, Bleich gives us a preview as to what sort of standard a new free speech restriction might employ. He cites polls to show that most Americans believe “that people should not be allowed to say things in public that might offend racial groups” (Emphasis mine). Well, what might that include? And what federal agency will pre-screen YouTube videos and render decisions? And what will the punishment be for saying something that might offend racial groups? Mr. Bleich is right that most states do not interpret the First Amendment as broadly as we do. But what if we apply his lemming-like thinking to other areas of social policy? For example, a majority of people in the world also oppose homosexuality—not gay marriage, but homosexuality itself. That doesn’t make it right to do so. Argument 2: The sacredness of the First Amendment emerged by accident. Eric Posner’s astounding column in Slate argues that, while the First Amendment was written quite some time ago, no one really cared until the 1960s, when liberals and conservatives began trying to appropriate it to silence their cultural foes. Therefore, our attachment to the First Amendment is nothing more than a historical contingency. Well, so what? What social norms aren’t historically contingent? Oh, please. This is the kind of paragraph that only appeals to people who automatically get angry when they read the word “corporation.” The corporation didn’t restrict speech. It just made a decision about where it would project that speech itself. That has nothing to do with restricting the filmmaker’s rights—Google just exercised its own. Most tellingly, Mr. Posner describes The Innocence of Muslims as “a video that, by the admission of all sides, has no value whatsoever.” This standard is clearer than Bleich’s: if no one will admit that a piece of expression has value, the maker goes to jail! By making “value” his standard, Mr. Posner shows that he has no understanding of the principle of free speech: the premise isn’t that all expression has value, but that no one deserves the power to assign that value on our behalf. Argument 3: The West is hypocritical. Two recent examples of this argument: Many, including Hezbollah leader Hassan Nasrallah, have pointed out that many Western countries imprison Holocaust deniers but not blasphemers against Islam. They are right: there is a hypocrisy here. But it should be resolved by legalizing Holocaust denial, not by banning blasphemy. Also, for what it’s worth, Holocaust denial is legal in the United States. Second, Egyptian journalist Mona el-Tahawy was just arrested for spraying graffiti on an ad in the New York subway systems which calls Palestinians “savages” and calls for a fight against “jihad.” Facebook and Twitter abound with condemnations of this double standard; why arrest el-Tahawy but let those responsible for the poster off the hook? Well, the posters are vile, but it’s not hypocritical to arrest al-Tahawy. Whatever you think of the poster or of her actions, graffiti-spraying on public property is against the law—a law that the racists who bought that ad space didn’t break. “No amount of violence should intimidate the United States into changing its laws,” writes Erik Bleich, right after he advocates changing the laws. I believe that Mr. Bleich, Mr. Posner, and the many other writers advocating less freedom of speech really think they haven’t been intimidated. But they have. They aren’t worried about speech that merely expresses hatred. For them, unacceptable speech is defined by the violent reaction it incurs. That’s called letting murderers write the law. This week, I started my internship at the State Department, working on Middle Eastern issues. Many of my new colleagues knew and worked with Ambassador J. Christopher Stevens, who was murdered, along with three other Americans, in Benghazi yesterday. The killings apparently came in retribution for the posting on YouTube of a trailer for a low-budget, obscure movie that had nothing to do with Ambassador Stevens or the U.S. government and that would certainly have otherwise remained unknown to the American public. The murders were outrageous, inexcusable, and—what’s the word apologists for these acts always use—offensive. Not only that: they would have been just as inexcusable and outrageous had the victims been the makers of the movie. The degree of offense caused by a movie, cartoon, or any other form of expression is absolutely irrelevant to the moral justification for taking up violence in response. Being offended is no excuse, and no mitigating circumstance, for murder. It’s not that the video wasn’t offensive. The point is, it doesn’t matter whether it was or not (indeed, in this case offense may not have even been the motive). There are plenty of offensive videos out there. The U.S. Government did not promote, endorse, finance, applaud, refer to, or know about this video until its diplomats were murdered over it. The murders, not the video, are why the White House and State Department are involved. And the murders, not the video, are all they should be condemning. Generally, that’s what they did. The only clause that didn’t focus on the victims or on condemning the attacks came in the second paragraph of the White House’s prepared statement: “While the United States rejects efforts to denigrate the religious beliefs of others…” Secretary Clinton’s remarks didn’t even go that far. She focused entirely on honoring the dead and condemning the killers. The video in particular was never referred to in either statement, and no blame was placed, even implicitly, on anyone but the killers. While I do think the administration should have been completely unequivocal, it did strike the right tone in general. The same cannot be said of the Romney campaign, which took that grain of truth and turned it into an overstated, ill-timed, tasteless distortion that further raised the eyebrows of a public already skeptical of the Republican candidate’s ability to handle delicate diplomacy. Although the right-wing fringe stood by the nominee, the reaction of most GOP leaders, normally Borg-like in their reflexive condemnation of the President and anxious to project a united front as the campaign heats up, ranged from silent to critical of Romney. Most importantly, even if the President’s statement equivocated somewhat, I have little doubt that any president would have done the same given the stakes in the region and the desire to retain the good will of the Muslim population at large. I’m sure you’ve heard someone say something like this after some heinous act of violence in the Middle East: “Where is the outcry among the Muslims? Why do they only protest American policies and Quran burnings and not the murder and sabotage that follow?” Good questions. But this time, they’re being answered. These are the first photographs I’ve ever seen of protesters in the Arab world, publicly opposing acts of violence that came in response to insults against Islam. Many of them do so unequivocally. The second week of May brings mixed emotions to Moshe Baran, my 91-year-old grandfather (or Zeyde, in Yiddish). May 7th is the anniversary of his wife’s death from cancer five years ago, while May 8th is V-E day. Sixty-seven years ago yesterday, the Nazi state crumbled in the dying heave of the greatest and most terrible battlefront in history. That front had swept Moshe up along with many others, enveloping him in a Soviet uniform. For the first time since 1939 peace settled over Europe, desolate and smoldering and strewn with corpses. 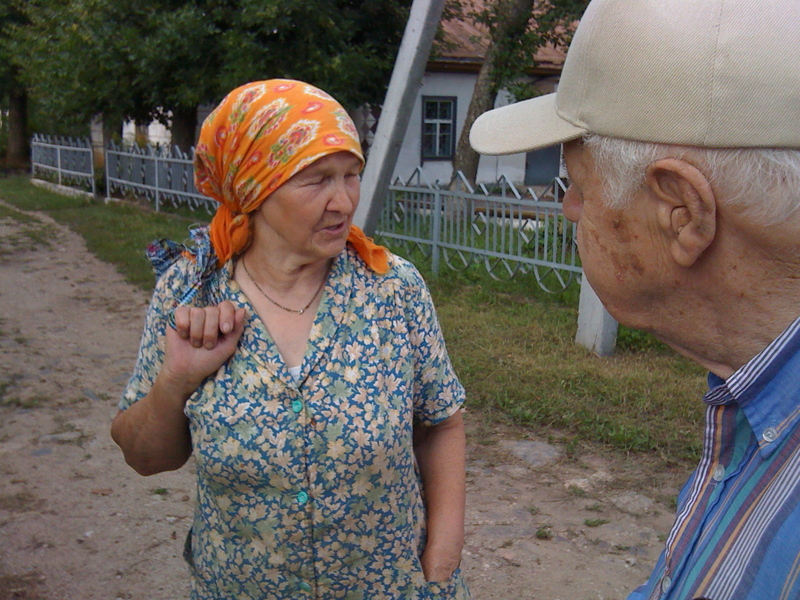 The war had begun for Moshe in Horodok, a small shetl in the Belarus countryside, which fell under a two-year Soviet occupation. Two years later, Hitler had launched his surprise attack on the Soviet Union, and Moshe had become a fugitive of the ghettoes, then a scout and fighter in a partisan brigade. He now stood in Germany, a draftee in the largest army on earth: a Soviet occupier. Moshe was unusual among the Jews still alive in Eastern Europe—most of his immediate family had survived as well. In 1942, early in the German occupation, he had exploited his privileged status as a slave laborer, and the decency of a kind German overseer, to smuggle weapons from the ghetto into the forest, which secured him access to Russian partisan groups. He also arranged passage for his mother and younger brother and sister to a camp in the forest full of Jewish escapees. When his other sister (my great aunt) fell ill, their father (my great grandfather) stayed in the ghetto with her for a few days. 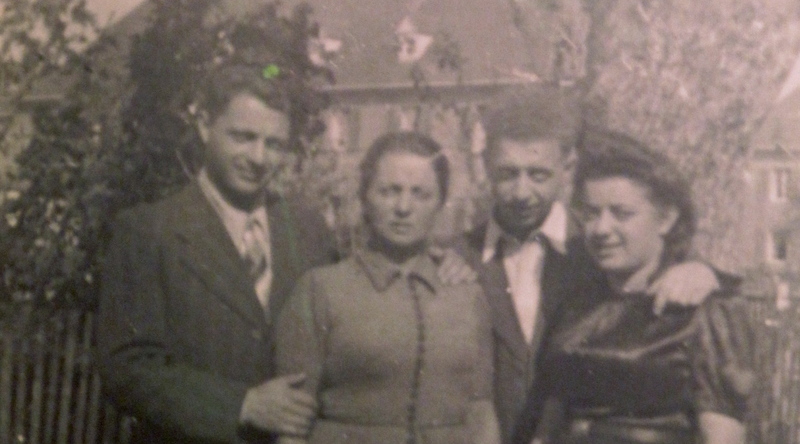 It was during her convalescence that the local authorities liquidated the ghetto; German soldiers locked my great aunt and great grandfather with the other Jews in a small wooden building which they then set on fire and riddled with bullets. The heap of burned remains, its stench pervading the town, was burned repeatedly over the following weeks by German soldiers, who also occasionally threw grenades into it in a vain disposal effort. A local eyewitness gave us his account of the massacre when we visited the town in 2010. Bear in mind that Moshe’s family, having lost only two of its six members in addition to all of its cousins, was among the most fortunate Jewish families in occupied Europe. This episode took place in Krasne, the town to which the Jews of Horodok, the hamlet of Moshe’s birth, were relocated after a similar massacre there. That no one has heard of these towns is chiefly because due to the banality of such barn-killings in Belarus at the time, to say nothing of their insignificance in comparison to the more ingenious methods of killing then coming into use in Poland, a few hundred miles to the west. Moshe kept his mother, sister and brother provided for in their wooded refuge, where word came to them of the Krasne inferno. He fought alongside the Russian partisans: sabotage, skirmishes, but mostly hiding. Finally, in the winter of 1944-1945, the Red Army’s advance engulfed the area. Many of Moshe’s Russian fellows had been stranded during Stalin’s chaotic retreat from the surprise Nazi attack in June 1941. Now the Russian behemoth digested and re-assimilated the brigade. The Red Army marched through Danzig, and then along the cold northern coast of Europe, until word came that the war was won. What does one do after his village has been obliterated, and his community ripped from the continent? Zeyde had been active in Zionist organizations as a teenager, and now found that the Nazis had put a finer point on Herzl’s message. For many Jews, Israel had been an ideal; now, it was a last resort. 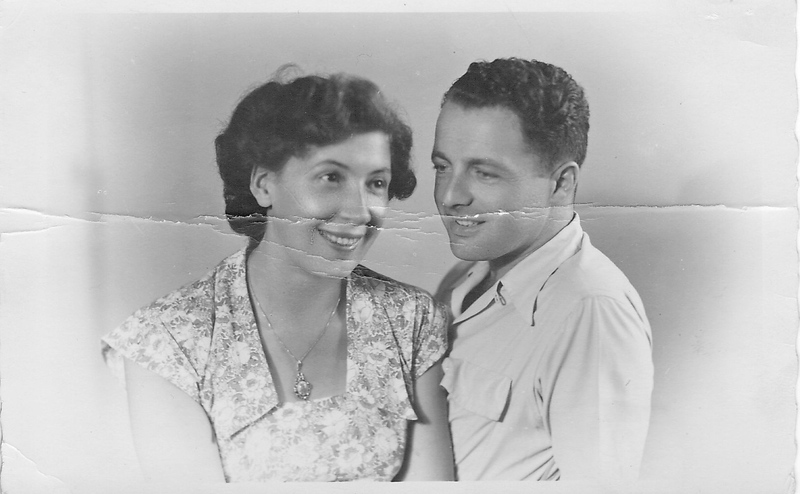 Moshe hoped to move to Palestine with his family and his fiancé, Malka, whom he had met in a displaced persons camp in Austria. Malka’s story was more typical: she had spent the war enslaved in a munitions factory in Poland and had lost her entire immediate and extended family to the genocide (save one aunt, who would turn up later in Israel). She was willing to follow Zeyde anywhere. Palestine it would have been, then, but for Zeyde’s mother Esther, the only mother from Horodok still alive. She vetoed aliyah; she had endured two wars and would be damned if she was going to let her family place itself in the way of another. And so the Barans joined the huddled masses, entering via New Orleans to stay with relatives in Shreveport, Louisiana, and later to Brooklyn, where they started life again. Their older daughter, Bella, ultimately did make aliyah, and raised two daughters in Israel. My mother stayed in America, where she raised my siblings and me. It is not Zeyde’s fight for survival that carries lessons for me, but the condition in which he emerged. He is free of bitterness. He carries no visceral hatred of Germany, nor loyalty to Russia. He feels loyalty to the Jewish people while maintaining intellectual courage and independence. He demonstrates the durability of curiosity, wonder, decency, and humor. His story, moreover, is instructive for students of global politics: Mad ideologues often mean what they say, and can persuade ordinary people to commit extraordinary crimes. The evils in a country’s history do not absolve it of the obligation to confront evil elsewhere. And finally, the mere choreography of democracy is insufficient to ensure human freedom. Al-Jazeera: Grow Up. Cover Israel Seriously. Last October, Dan Schectman won the Nobel Prize for Chemistry. Schectman, a professor at Israel’s Technion (the country’s top technological institute), was working at the U.S. Department of Energy when he discovered the first experimental evidence of quasicrystals, which had long been dismissed unscientific fantasy. The details of quasicrystals’ redemption at Schectman’s hands are too obscure to be of interest to me. They were of great interest, however, to the Nobel Committee, which made Schectman the fourth Israeli chemist to receive the prize. Israel surpassed the Netherlands to become the world’s seventh most-awarded country in the category (tied with Sweden). Israel’s small size, one would think, makes this an achievement of some note (in terms of total Nobels, it tops Spain and China), to say nothing of its radical implications for chemistry. Don’t stop reading; my point here is not to brag about Israeli Nobel Prizes. As they invariably do when the eminent Swedish conclave renders a decision, the world’s major news organizations reported on the win. The New York Times carried the story, as did sources as diverse as The Guardian, Chinadaily.com, Turkey’s Hurriyet Daily News, and, needless to say, the Israeli media. Al-Jazeera.com’s archives hold about a dozen articles about Tawakkul Karman’s receipt of the award for her activism in Yemen. Liu Xiabao’s 2010 Nobel Peace Prize and the wrath it drew from Chinese authorities merited a mention. Hm. Maybe Al-Jazeera only really focuses on Nobel prizes involving political opposition, given the relevance of the topic to its readership—oh, wait a minute. The network covered the 2011 Nobel Prizes for Physics and Economics, both won by Americans. So it is interested in science, it cares about Nobel Prizes, and it covers stories from around the world (not that Israel is too far away). I searched for Dan Schectman in Al-Jazeera’s search tool. Nothing. I took the web site’s advice and made sure “all words were spelled correctly.” I also “tried different keywords.” Still no luck. Israel’s barring of Nobel Prize winners is newsworthy, but Israelis’ winning of Nobel Prizes is not. Hoping to redeem al-Jazeera, I set out to find the most positive news story I could on Israel. I just typed “Israel” into the search box. I found 2 critical op-eds, a story on the dispute with Egypt over gas prices, a story on the approval of 3 new West Bank settlements, a comparison of Iranian and Israeli military capabilities, and such titles as “Israel Hedges its Bets on Syria” and “Is Israel Fuelling Fear Not Facts Over Iran?” (I’m not sure how one goes about fuelling facts in any context). “Israel child” returned a story about child marriage in India (followed by a story on the injury of a Palestinian child by an Israeli airstrike). Al-Jazeera’s justification of this appalling self-censorship can take three forms. One: “The Israeli government’s crimes against Palestinians and its regional aggression are so grave that we simply cannot spend time reporting virtually anything else about the country, except for its advances in the field of medical marijuana.” Al-Jazeera is a huge organization with global reach. It has covered the Michael Jackson trial, the EU’s lifting of a ban on battery cages for chickens, Christianity in China, and Brazilian soccer. Two: “Because we don’t recognize Israel, we don’t cover it.” The obvious problem with this explanation is that Al-Jazeera absolutely does cover Israel. The network has grown rapidly over the past decade, often ignites controversy with its debates and participatory formats, and has contributed admirably to the Arab Spring by broadcasting footage taken by ordinary Arab citizens. 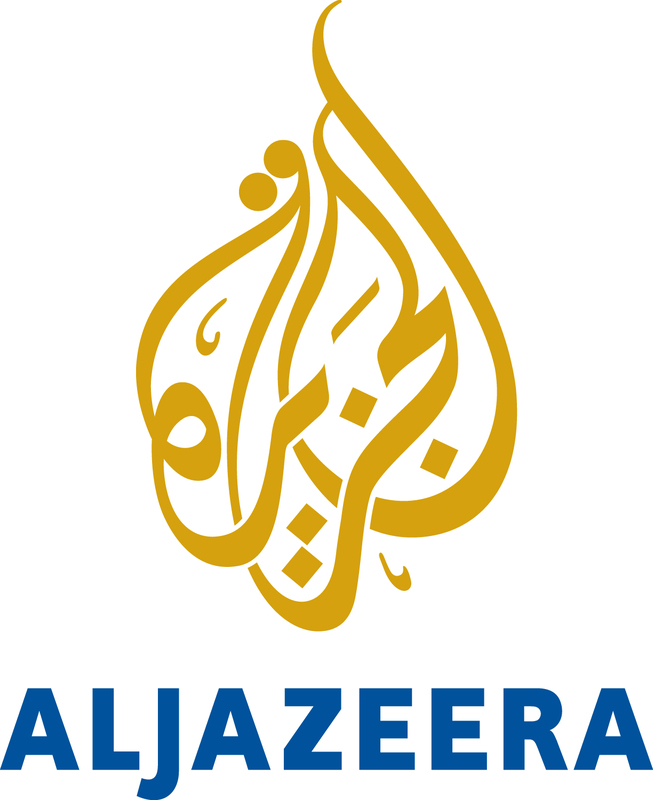 All of this has strengthened Al-Jazeera’s reputation as an independent and reliable news organization. But when it comes to Israel, Al-Jazeera and its owner, Qatar, still need to grow up. Update: A friend has pointed out to me that there is, strictly speaking, no Nobel Prize in Economics. Rather, the Nobel Foundation offers a Nobel Memorial Prize in Economic Sciences. It was first awarded in 1969. On January 11, I criticized Marwa Daoudy’s argument against military intervention in Syria, and on February 6 I rebuked common arguments against humanitarian intervention generally. While this choice of topics suggests an adventurist bias, I remain ambivalent on the question of whether (and how best) to intervene in Syria. 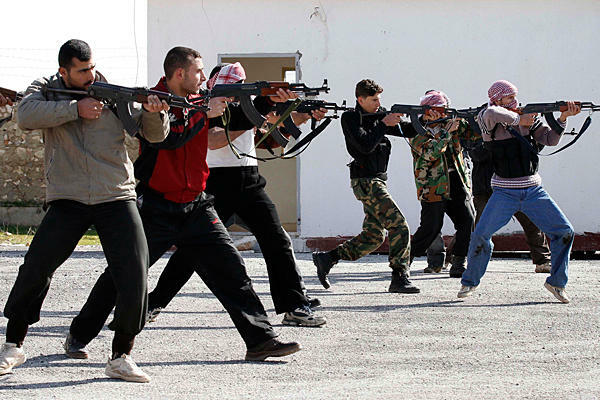 Is arming Syria's opposition worth it? The most widely discussed option for doing so is using Syrian rebels and defectors as proxies by arming and supporting them, though one hears phrases like “safe havens” and “air support” in the discourse as well. Advocates and opponents of intervention agree that the isolated and blood-soaked Assad regime is finished, despite the support it still commands among some minority communities in Syria. Let us weigh the arguments, keeping in mind that this question is already more than hypothetical. Marc Lynch, counseling prudence in a recent blog post, poses six important questions to those who would intervene: Whom to arm? How would arms affect the opposition? What is the endgame? How would the regime react? What if the rebels, once armed, fail? What if they succeed? His answers amount to four broad warnings: that arming the rebels will divide and corrupt them, that it will cause violence to escalate, that it will lead to mission creep, and that it will prolong the war by turning into a costly stalemate. Roger Cohen acknowledges in The New York Times that such a stalemate is likely, but asserts that it is also necessary in order to force Assad to negotiate. He is in favor both of arming the rebels and of establishing refugee havens in neighboring countries. Professor Lynch’s concerns seem prescient. I believe they are. But most of them will not be fundamentally exacerbated by our arming the rebels. The factors militating against arming the rebels—our lack of familiarity with the rebels, the potential for political ambition increasing in step with physical power, the potential for increased conflict, and the reluctance of rebels to disarm after they remove Assad—are problems we must confront regardless of whether we are the ones to arm them. He lists three possible goals for arming the rebels, and dismisses each: if the weapons are defensive, they will inevitably sow instability. If they are meant to enable the rebels to unseat the regime, then they are insufficient. If they are meant to effect a stalemate and talks, the plan will backfire as the flood of weapons ignites a civil war and the chance for a peaceful resolution dies. Civil war has already come to Syria. Assad is already refusing to negotiate. The international community may call for high-scale intervention in the future whether low-scale intervention occurs now or not. Disunity and instability will attend any post-Assad scenario. It is also by no means clear that simmering slaughter is preferable to all-out war in the long run. 1994 Rwanda reminded us that widespread savagery, at least sometimes, is possible without advanced weaponry. There are also those who warn of boosting support for the regime by confirming narratives of a foreign insurgency engineered by the West. This should only makes us hesitate to arm the rebels, though, if it means that doing so benefits the regime more than it benefits the rebels. Unavoidable truths loom in Syria no matter what the world does: Distrust and tension will prevail with or without Assad. Instability will persist. Many more Syrians are going to die. The prerequisite for intervention should not be certainty of a perfect outcome, as some appear to think it should We will carry regrets down any path we take. Rather, we should ask, given what we know and can reasonably predict, whether the good we can do by arming Syria’s rebels outweighs the bad. Jordan Plays Defense: Will it Be Enough? King Abdullah II: Can he play defense? Talk of the wave of change sweeping the Arab world sometimes makes it sound as though every country in the region has experienced seismic political upheaval. Many haven’t, including Jordan. But according to a recent New York Times article, the small kingdom’s peace may be short-lived. The reasons for popular restlessness should by now be clear; the question, in Jordan’s case, is why nothing happened sooner. In 1998, Glenn E. Robinson described the forethought and skill displayed by the Jordanian monarchy in pursuing a strategy of defensive democratization: “The regime undertook sufficient reform to ensure its political longevity, but without altering the core structures of power in Jordan.” What was this reform, and will it see the monarchy through the Arab Spring? Jordan is unique in several respects. Its monarchy comes from the once-powerful Arabian Hashemite clan, ousted by the Saudis; it lacks the capacity to exploit much of its energy resources, unlike other Arab monarchies; it has made peace with Israel, despite the many “West Bank Palestinians” it hosts; and it is a staunch American ally. It also lacks the epochal cities of which other Arab states can boast: Marrakesh, Aleppo, Baghdad, Cairo, Jeddah, Beirut. Jordan is also smaller than any of the states that have thus far shown their rulers the door (none of which are monarchies); it has 60% of Tunisia’s population, and less than a third of Syria’s or Yemen’s, and less than a tenth of teeming Egypt’s. Jordan’s population (6.3 million, 2.5 million of whom live in Amman) is smaller even than Israel’s. Jordan’s small, tribal (yet urban and educated) population, lack of clear geographic or economic nerve centers, and U.S. backing may help explain the durability of its monarchy. But the Hashemites have been anticipating, outpacing, and pre-empting liberalizing forces in Jordan for decades. To them, the Arab Spring is just another season. In 1970, Jordan crushed the PLO and drove it into Lebanon in what became known as “Black September” or, as the government poetically remembers it, “the era of regrettable events.” Since then, however, its style has been more subtle. Like the Egyptian regime, King Hussein tolerated the Muslim Brotherhood as an anti-leftist bulwark while banning other political parties and suspending parliamentary sessions. Thus began a show of pluralism which ultimately strengthened the monarchy. Parliament was reconvened in response to unrest in 1989 stemming from the decline of aid transfers from rich Arab neighbors, which had paid for subsidies and welfare programs Jordanians had come to depend on. King Hussein’s call for elections may seem more like “reactive” than “defensive” democratization, but it pre-empted calls for systemic, regime-level change and created a new arena in which political energy could be expended, full of new targets at which to direct it. In 1992, the King had a National Charter written, and new elections were held in 1993. More recently, King Abdallah II (Hussein’s son and Jordan’s fourth Hashemite king) has granted still more concessions: prominent political figures and businessmen are on trial, and key subsidies remain untouched. Also, Jordanians have witnessed the turmoil in Iraq and the bloodshed in Syria. Not everyone wants to rock the boat. Still, calls for systemic change are more audible than in recent memory. “Our main purpose is to return authority to the people and to have a monarchy similar to that in Britain, a constitutional monarchy,” said a former Parliament member at a recent anti-regime protest in Karak, long a regime stronghold. Can the monarchy last? Can it oversee a peaceful transition to democracy? The Hashemites have played this game skillfully, without some of the benefits other monarchies enjoy. But the people are saying things they have never said before. Update: My friend Jason Stern hears similar rumblings in Jordan.